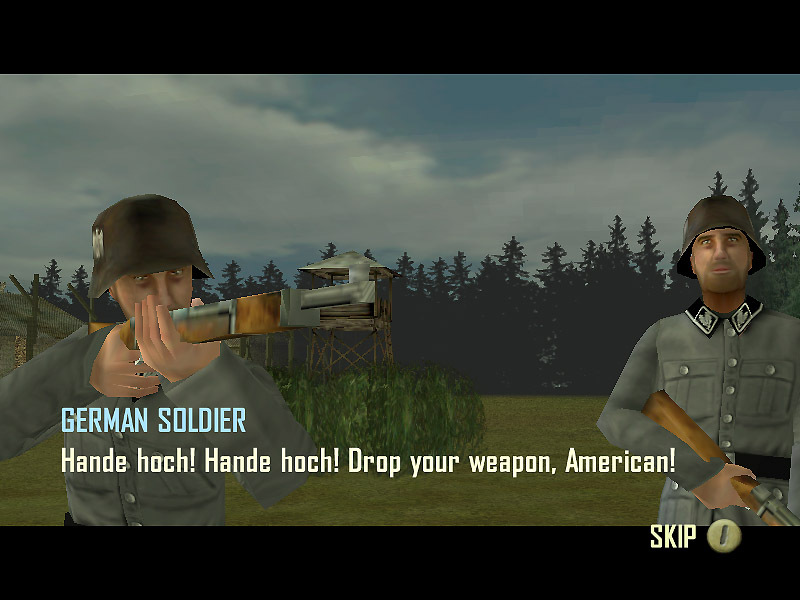 Prisoner of War is an evolution, of sorts, of the usual mind-assaulting first-person shooters – or a regression, depending on one’s perception. True adventure games with more puzzle solving and limited or no violence are rare; such a title set in the chaos of World War II makes for an even more interesting game. I tried hard, however, to not like this game; I’m afraid that this perception came from the plethora of lukewarm reviews that have preceded mine into print regarding this title. Something tugged at me, however, to check this one out; I had a feeling I might not be disappointed. Besides the Cold War, very little can evoke images of skullduggery or sneaky missions performed behind enemy lines like World War II. OSS agents mixing it up with fedora-donned instruments of the Gestapo and their jack-booted gun-toting guards…it’s a time of intrigue that helps to define modern standards for suspenseful storytelling. So bring in Prisoner of War. No, it’s not about spying, but the premise is similar: an Allied pilot is shot down behind German lines while running a photoreconnaissance mission. He’s captured and brought to a sort of way-station (which doubles as a truck depot) for prisoners that are eventually shipped off to the official Stalag Luft prisoner-of-war camps. The pilot, one Captain Lewis Stone, resolves immediately and heroically to not stand for such imprisonment, and is off on one minor adventure after another to outwit his German captors and escape to freedom. Along the way, he uncovers a heinous plot that he tries to stop. 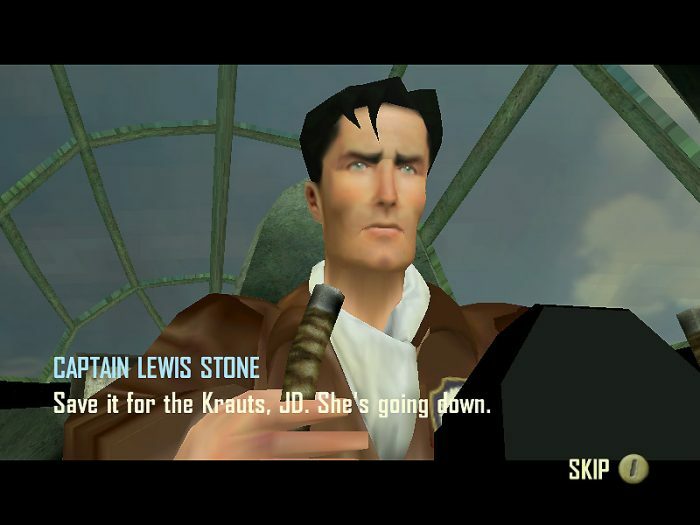 The player will delve into the role of Captain Lewis Stone, an American pilot shot down over war-torn Europe – where exactly, we don’t know. 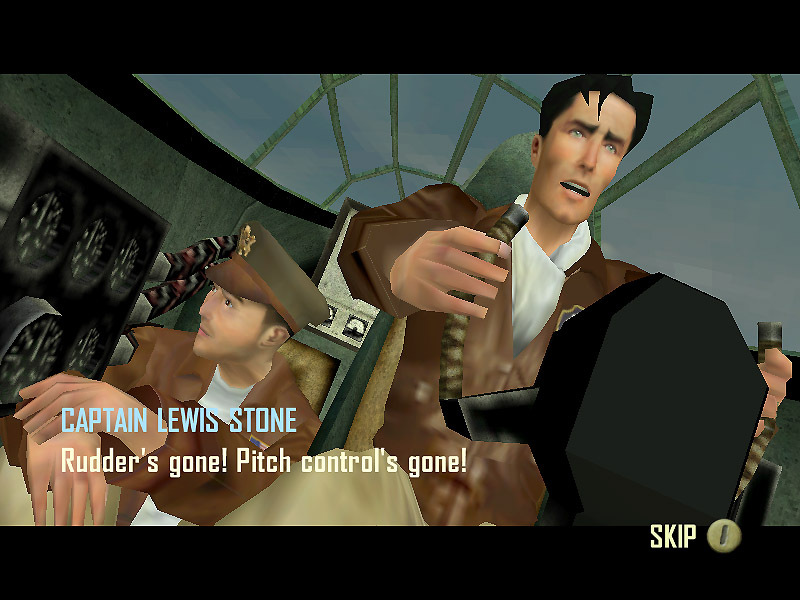 When is not known either; the only background about Captain Stone and his co-pilot/smart-aleckey/womanizing sidekick, JD, is thrust upon the player in the middle of a photo reconnaissance mission; Stone stoically (and with square jaw) pilots the aircraft (which looks vaguely like a B24, but the layout inside seems wrong), with JD sitting below him and to his left, readying a camera. The plane, Stone, and JD are moving through a flak-filled night on a mission of obvious importance. Stone and JD trade flat banter – but wait, how can they hear each other? Stone’s piloting without a flight cap, oxygen mask, or headphones. The oxygen mask I can understand being missing – the mission is low level, apparently – but having a normal conversation without screaming at the top of one’s lungs over the roar of engines, or without the aid of a communications device is an exercise in futility. Instead we are rewarded with a look at Stone’s stoic and all-American features. Grognard or not, a player will likely smirk at this scene. JD (left) doesn’t look too terribly concerned with the idea of crashing violently into the ground. Such action doesn’t lend itself well to the beginnings of this game; I rolled my eyes no less than half a dozen times during the first ‘chapter’, which is how this game categorizes each goal. There are five in all, and throughout each there are several mini-missions which Stone must complete in order to progress in the chapter. This first one is laced with ludicrous, almost side-splittingly funny scenes, which are possibly not intended to be so. The German guards in the first chapter look as if they’d just come off of a Woodstock bender, with red-rimmed eyes and vacant stares. Their Kommandant, a roly-poly stereotypical German officer (sans monocle, although this will appear later on another one), is even more laughable with an unsettling smile that is sometimes seen on recalcitrant serial killers. Coupled with the red eyes (must be something about the camp), the player will get the feeling that they’re in some kind of Prisoner of War Theme Park and not a real holding cell. I’m all about this kind of storyline; “Von Ryan’s Express” is one of my absolute all-time favorite novels. The story of a large group of Allied prisoners escaping from the German’s clutches is full of heroism and suspense. So is, for that matter, the classic film “The Great Escape.” But Prisoner of War does for these classic stories what “Hogan’s Heroes” does for realism…and Sergeant Schultz is a much more competent fellow when compared to some of the guards populating this sad sack of a camp. That’s not necessarily a bad thing, though; if the old movies and shows are entertaining, then this game won’t fail to be. Doesn’t he just look stoic? I can overlook the occasional snafu, but how does one have a normal conversationin mid flight without (a) a mask, or (b) headphones? Not to mention (c) his flight cap? Maybe that square jaw just doesn’t fit in ‘em. 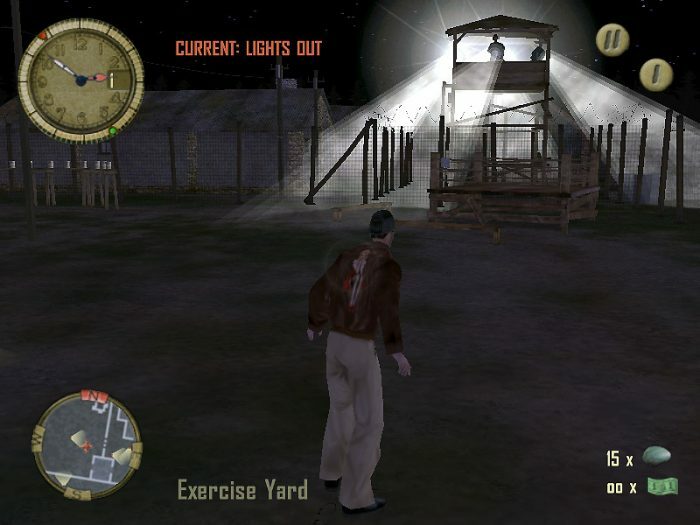 Players take on Stone’s persona, moving about the camp, interacting with other prisoners and guards, stealing contraband, and continuing the storyline by accomplishing small missions. 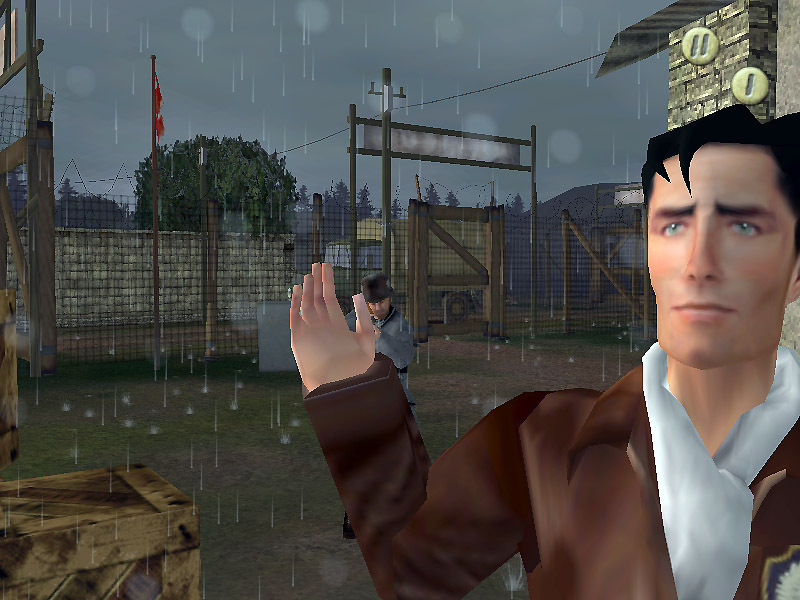 The player views Stone from behind, which makes normal manipulation difficult; the camera can be moved around him easily enough with the mouse, and the directional keys used to move him depend upon which way that camera is facing. For example, if he’s facing the player and the ‘forward’ key is pressed, Stone will walk towards the player. If Stone’s back is turned to the player, pressing ‘forward’ will make him walk away. Straightforward enough, but moving him side-to-side and keeping the camera at a good angle makes for some difficult manipulations. However, it does give the player the widest possible field of view, and there is a first-person view; that view, though, is more difficult to spot items in. Usually these missions are nothing more than stealing something from somewhere that is off-limits to Allied prisoners like, oh, the guard’s barracks. One normal person would think that these kinds of ‘midnight’ raids to collect “currency” (which greases the wheel and gets Stone much-needed items to help him complete his missions) and otherwise throw a wrench into the Luftwaffe guards’ plans for the day would involve some serious suspense and/or life or death situations. Unfortunately, these situations never quite resolve themselves in this manner; getting caught means being put into a brig for the remainder of the game day; being shot by a guard means being put into the infirmary for several days, depending on the severity of the wound. Other than that, once Stone is returned to the game, all is well and normal. This makes no sense, especially if the player is busted continuously and receives little more than a slap on the wrist. The game book hints that there’s a finite amount of time in which to escape and finish the game, but the exact time limit is never held over the player’s head and therefore doesn’t become a consideration. Busted again. Oh well, tomorrow’s another day. To be fair, in a game such as this getting shot would be a game-ending experience. So would getting caught somewhere Stone’s not supposed to be; in the Real World, anyway, these kinds of transgressions wouldn’t be looked upon so lightly (at least after half a dozen or more similar infractions, anyway). So there’s a gameplay balancing effect by letting Stone off lightly when caught and not letting him die when he gets shot. This is an appreciated inclusion of this game, but brings to light the inadequacy of a linear mission format that allows only one or very few successful paths to completing missions. If any mission becomes particularly frustrating, the gamer may feel like they’re bashing their head against a wall. There is a solution, however, and usually more than one. Red-rimmed eyes, a vacant stare…you do the math. Not to mention a square rifle with a solid barrel…what’s up with these guards? Captain Stone’s duty as a member of the military is to escape the clutches of the Germans as soon as possible. As previously mentioned, the game vaguely hints at the limited amount of time available from the beginning, since Stone is occupying an ersatz prison camp added as an afterthought to a large truck depot. When he’ll be moved, well, that’s anyone’s guess but the Germans, and they’re not telling of course. As Stone progresses through the game, there’s not much beyond close tangles with the Luftwaffe guards that will make your hair stand on end. I was feeling that way at first, and my heart pounded as I scaled my first wall illegally. But when I was captured doing it the first time (in full view of a guard, oops…heh-heh), the resulting lock-up in a cell first made me furious for being caught so easily, but then that gave in quickly to confusion as I was let out almost immediately on the following morning; no ifs, ands, or buts thank you, not even a “behave yourself Amerikaner or you vill be SHOT!” or anything. The missions Stone goes on are straightforward; early on, one prisoner offers a promise to help him escape if Stone gets some “currency” from the on-base hospital. In this case, that means acquiring liquor, medical instruments, and other things. From seeing some of the guards (not to mention the camp commandant…I wondered if that guy ever slept from the look of him), and knowing that this other prisoner uses the currency to make deals and trade with those same guards, I wonder what some of this ‘currency’ really is. I just couldn’t get past his red-rimmed bug eyes…how could anyone take him seriously? These missions aren’t impossible, and are more often than not trial-and-error mixed with common sense. For example, don’t jump over walls when guards are watching, don’t make noise when they’re near, and crouch down and sneak a lot to avoid being seen. If Stone evades these guards and gets to his goal, usually he has to sneak back into camp before a certain time. Missing important events such as roll call can result in a camp-wide search for Mr. Stone and result in him being thrown into (wait for it…) the brig. Some missions allow a lot more leeway for attaining goals, while others need perfect split-second timing. Given the linear trial-and-error nature of the system, it is virtually impossible to succeed on the first try in the latter missions. Since no player may continue in the storyline until a mission is completed, they’ll have to try and try again until they succeed. Also, there’s no in game save feature; the game does automatically save after you successfully complete a mission, but this can make for a more frustrating experience especially if Stone is very close to completing a mission but gets caught at the last possible second. The game installed flawlessly and ran without a hitch. The documentation is cleverly done so as to look like a journal of the main character, Captain Stone. Within, game controls are described as if close secrets written by a man a hair away from discovery and ruin. I appreciate imagination going into documentation; having a drab book that merely lists the mechanics of the game makes for an equally drab read, which can equal frustration down the road because the player didn’t delve enough into the pages of the book. Furthermore, the documentation is short, and interspersed with drawings that not only give a feeling of reading a journal but also make reading easier. However, I do have a problem with the game’s opening sequence. When started, a small options window will appear. Unfortunately, it’s in German, not English, which could be a handicap if Deutsch is not a readable language. This appears even when setting the game’s language to English when it’s installed.. It’s not impossible to decipher for anyone with a few years of German from high school and college (and I was so inclined), but still it is an unnecessary hindrance. 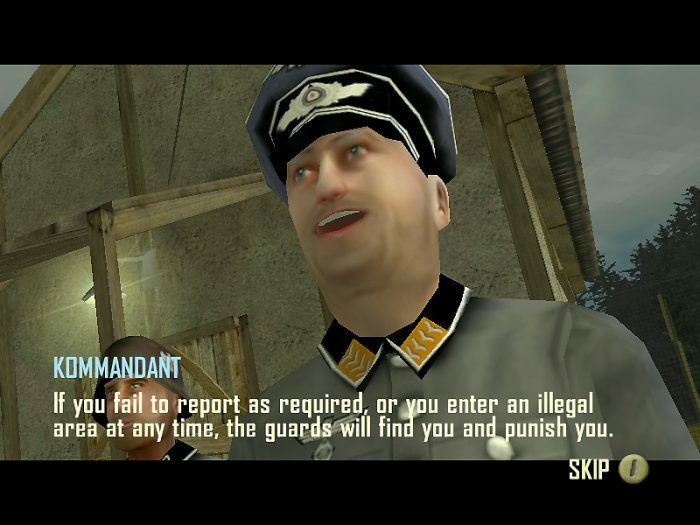 The graphics are good, but somewhat annoying with some of the characters (see above for descriptions of the German guards in the first chapter). The environment is well-done, with the prison camp feel coming across well; sneaking around in forbidden areas, while not a life-and-death situation, still makes for a meaty bit of fun – especially at night, with some tension at times deep enough to sink one’s teeth into. Unfortunately, this feeling is not all-pervasive and at times is comical. It’s almost 3 a.m. Do you know where your prisoners are? Hope Stone didn’t eat anything unsettling for dinner. One small noise and the guard’s got him. As bad as the accents are, at least they come across as enthusiastic, which makes up for the almost-cheesy sound they make. In fact, the entire game plays out almost just like one of those World War II films that make an appearance on cable TV at times, and the player may perceive the same feeling of wistful interest as they would while watching an afternoon matinee. Escaping in this first chapter is nothing really more than hiding effectively and not getting caught. Stone, controlled by the player, shimmies up walls and sneaks quietly through guard’s quarters as he makes his appointed rounds as a duty-bound officer to support his escape. Along the way Stone will steal “currency” – in-camp lingo for alcohol, cigarettes, and other valuable and rare commodities – to grease the palms of his fellow campers and acquire useful items like boot polish, telescopes, and even advice. The Monocle! I knew it! But Prisoner of War has something about it that lets it grow on you slowly; the game has a subtle way of drawing one into its storyline, by starting off easy and slowly strangling that ease in favor of challenge. The first chapter’s laughably small ‘holding camp’ was ostensibly built as an afterthought to a large truck depot to serve as a temporary way station for Allied airmen destined for the much larger Stalag Luft prison camps. Progression in subsequent chapters gets Captain Stone eventually into a castle, the ultimate adversary in the escape game. Escaping would seem to be a life-or-death prospect, wouldn’t it? Getting caught in the wrong place at the wrong time should mean a quick end; however, in this game all it means is spending the rest of the day in the “cooler”. Get caught as many times as you’d like; you won’t be shot. Even if you’re shot, you can recover in the infirmary. Returning from either to the “normal” prison camp life is a no harm, no foul prospect. However, the player’s main enemy is the clock; only a certain number of days exist for Stone to try to get away. Getting caught or shot too many times can mean a poor score when time runs out. The somewhat free range that a player has allows the player to pretty much go where they wish…as long as they don’t get caught doing it. Time is one of the enemies here, not just the guards; a limited amount of time is available to Stone to move around, and while he can miss some minor functions (such as mealtimes), he cannot miss roll-calls. Doing so means a camp-wide search and a very high state of alert among the guards. Stone engages in no combat; his only weapons are stealth, disguise, and the player’s imagination. Usually, these guards are in a ‘normal’ state; they can be viewed on a radar of sorts in the player’s screen, with their viewing area showing as a triangle. If the triangle area is yellow, they’re not alarmed. 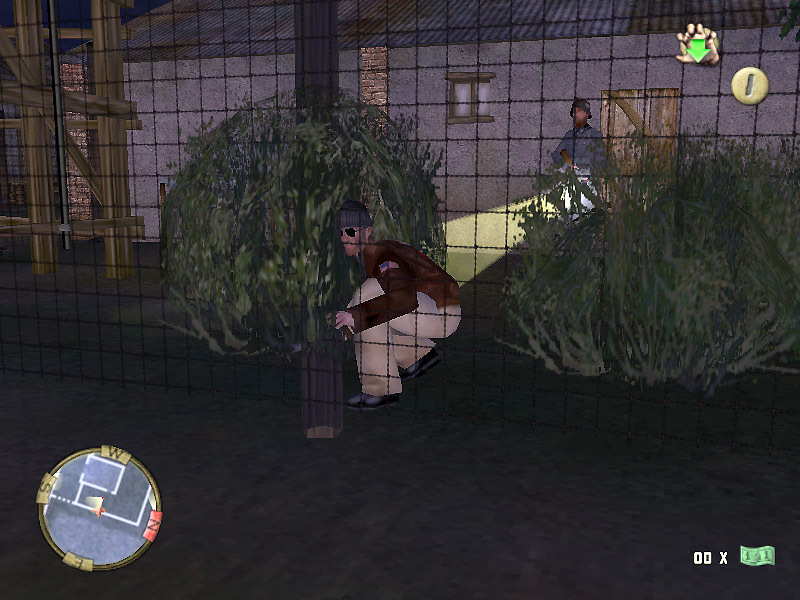 The color changes indicating the guard’s level of suspicion; movement and noise can alert them, and interestingly enough it is quite realistic – bumping into chairs, for instance, will cause a guard within hearing range to come investigate. It will take some to defeat an inquisitive guard, as they can be quite perceptive once their suspicion is aroused. Getting shot isn’t that big a deal; spend a few days in the infirmary and the player will be out in no time. The best thing to do is just avoid the no-man’s zone…when nobody’s looking. Guards will give a warning before they fire, too, so if that shout comes across your speakers, stay still and let ‘em throw you in the brig for a night – it’s better than losing too many days because of an injury. The computer characters are quite laughable, but do have a sense and perception that isn’t funny. Challenging this perception isn’t wise in the daytime, but nevertheless must be done at times. Nighttime is the best time for avoiding guards, and their keenness is dulled a bit then, and even more so if Stone has boot polish on his face. The AI can also, besides hearing noises if the player is so sloppy (as mentioned in the previous section), follow footprints in snow, or movement if Stone doesn’t stay absolutely still. Once noticed, it is hard to shake a bad guy, but not impossible. Moving slowly and silently are the orders of the day if these guys are to be fooled. 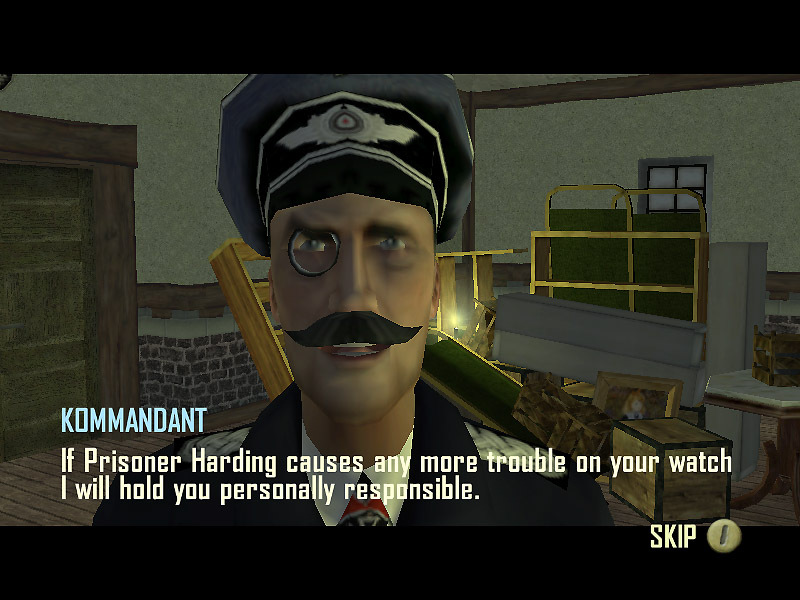 Characters behave realistically in this game; fellow POW’s will converse, argue, run, go to bed, and do other believable things. It’s almost interesting enough to simply watch the other characters, but there’s work to be done and they simply serve as a colorful backdrop to the storyline. No known game editors, besides the standard cheats found anywhere on the Internet, are available. This game would have some potential in this arena, with players creating their own POW camps and trading them for other players to try to break out of. The possibilities are endless here, and even a multiplayer arena with players posing as both guards and prisoners would be an interesting addition. Without this, the game lingers nowhere near its full potential. The thing that will bring players back time and again, however, is the grading system. Trying to go back and beat previous times is indeed a draw, but may wear thin after a while, especially if the game becomes frustrating. There are different ways of solving the various puzzles – at least, there are different approaches to each solution, anyway – and they can be explored in an attempt to get better times. The frustration factor rises if there is no immediate and obvious solution, so patience is required. No Multi-player is available for this title, unfortunately. 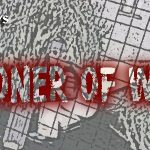 I really tried hard not to like Prisoner of War, mostly because of the lukewarm product reviews I had scanned over before accepting the title. However, I found most of the complaints, especially stating the game isn’t well done, to be unfounded. Most of the storyline is gripping, from an old World War II movie point-of-view, but if it is taken any more seriously than that, it will fail to impress. The target audience member for this game will have a serious interest in military history but a forgiving eye for detail, and an interest in watching old war movies. 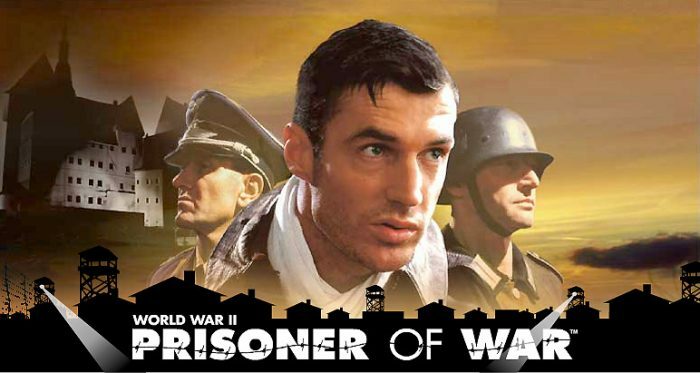 If this is appealing, Prisoner of War is definitely worth a look. Michael Eckenfels is a sometime technical writer and full-time gamer, living in the urban mosquito sprawl known as Houston, Texas. He writes for Games Unplugged and Campaign Magazines, and is a contributor to Eagle Games’ line of products. When not driving Kubelwagons at breakneck speed in Battlefield 1942 or playing any one of a collection of over a hundred board-style wargames, Michael spends a few moments of peace with his family. The Classic Reviews series is dedicated to republishing reviews from our staff that have appeared elsewhere, so that we can preserve them in the event those ‘other’ sites go dark or lose their archives.